Former Austrian school economist Bryan Caplan recently won a bet against Austrian school economist Bob Murphy on the path of US inflation. Caplan won by betting with the key market indicator (TIPS), Murphy lost by betting against it. At first glance, that the ex-Austrian won by following the market while the Austrian lost by not doing so might seem strange, but it instances why I am deeply unpersuaded by Austrian Business Cycle theory--that it is an analysis from a tradition that very strongly favours taking markets seriously (particularly their information revealing qualities) yet strikingly stops doing so to get a congenial theoretical outcome. 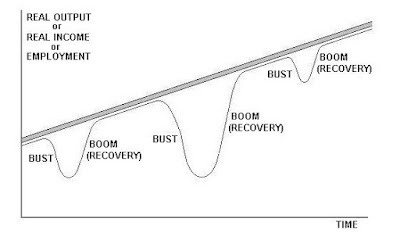 Austrian Business Cycle Theory (ABCT) is a theory of the unsustainable boom. It notes that capital is highly varied (or, economist say, is heterogeneous)--in particular, has a range of durations until completion. Interest rates coordinate current expenditure versus future income expectations. If the central bank, in order to foster economic expansion, sets the key interest rate "too low"--that is, below the level that will create a stable level of successful capital projects--then entrepreneurs are led to over-invest in projects because capital is cheaper than its actual long-term prospects justify. So, there is misallocation of capital--the profile of created capital does not fit actual expenditure patterns. This is what Austrian theory calls malinvestment. The result is a surge in failed business projects, consequently of failed or distressed firms, leading to income and expenditure cuts, leading to that transactions crash we call "recession" or, if sufficiently severe, depression. My objections to the theory are twofold: it doesn't fit the evidence and it is implausible even in theory. 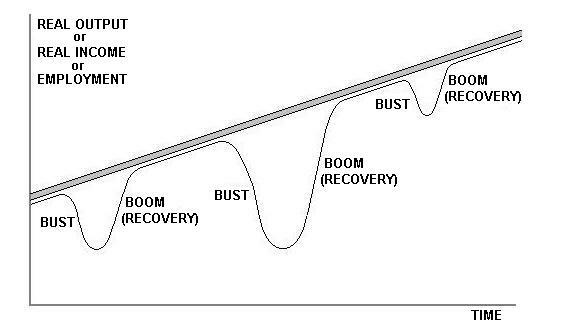 The theory suggests that the long-term economic pattern should be one of a surge in economic output above trend (the unsustainable boom) and then a crash below it. This is not the pattern we see: on the contrary, what we see conforms much more to Milton Friedman's "plucking model" (pdf)--that is, there is a long term growth trend that recessions and depressions "pluck" the economy away from (pdf). A pattern which suggests the economy is pushed (temporarily) off its growth path by various shocks. Despite attempts to claim otherwise, I am unpersuaded that ABCT can be re-construed to fit the evidence. Particularly as the theory also suggests that the crash should be correlated with the preceding boom--the further the capital overshoot, the worse the resulting crash. Again, this is not what we see (pdf). Recessions and depressions are not correlated with the preceding expansions, but are correlated with the subsequent expansions (pdf). A result which led Friedman to propose his "plucking model". Again, this conforms far better with the economy being shocked off its growth path before returning to it. Given that industries systematically vary by both the scale and duration of their capital creation, the theory also implies that the crash should hit in sequence and to varying degrees--the shortest capital duration industries hit first, the longest capital duration industries hit later; the lower scale capital industries hit least, the bigger scale capital industries hit most. These factors are, to a significant extent, contra-indicated--i.e. short duration capital projects also tend to be low scale capital industries while long duration capital projects tend to be high scale capital industries. Even so, there should a capital-profile sequence to industry downturns. 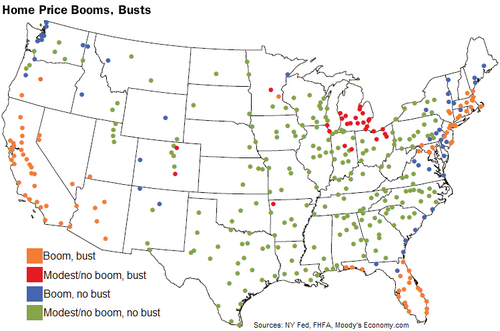 Again, this is not what we see: transaction crashes tend to hit all industries simultaneously. Such transaction crashes are most plausible assigned to the demand side (i.e. monetary factors) as, in a monetised economy, money is the thing which is one half of all transactions in all industries. Even when there are supply shocks, (1) monetary policy can counter-balance the effects and (2) such shocks are generally a specific shock to the economy, not rolling capital project failures. One might counter by arguing that particular projects are engaged in a rolling fashion. But that reduces the industry sequencing issue at the cost of undermining the systematic distortion effect. The theory also assumes that central banks are biased in one direction only--in an inflationary one. Yet the historical record shows that, while there is certainly a general inflationary trend for fiat money, there was no such trend by central banks under gold standards. And ABCT was originally devised in a gold standard world. Attempts to redefine "inflation" to mean "monetary/credit expansion" simply beg the question--an alleged cause being conflated into the presumed effect. Moreover, the historical record also shows that, in the right circumstances, central banks can be biased in a contractionary direction. This was most dramatically true in 1928-32 but also true from 2008 onwards: on both occasions, the contractionary bias was because central banks prioritised policy credibility (commitment to the gold standard; commitment to low inflation) over economic activity. In doing so, contractionary central banks created the most severe economic downturns of the C20th[last 100 years]. A business cycle theory that is so dramatically wrong about the two worst economic downturns of the C20th[last 100 years]--central bank policy in the opposite direction as predicted and economies consequently being shocked off their growth path--is not much of a business cycle theory. So, there are severe evidentiary problems with the theory as any sort of general business cycle explanation. Even saying "but it is just a theory of the unsustainable boom" suffers from the lack of instances it accurately describes. There are also some serious theoretical problem with the theory. The first is, ironically, not taking heterogeneity of capital seriously enough. Heterogeneity of labour and of capital leads to heterogeneity of debt and debt/equity profiles. How can there be a key single, natural or otherwise, rate which can distort the entire structure of investment? Including across its varying time frames, across which interest rates also vary. What we are looking at is a schedule of interest rates varying by time and asset. It can be argued that the central bank policy rate (the interest rate used to signal policy) effectively anchors the entire schedule, as the central bank is the monopoly supplier of the monetary base. Its policy rate is really an indicator about the future path of monetary policy, and an indicator which is a function of it being said monopoly supplier and its policy credibility. But an indicator which has far more direct effects on nominal interest rates rather than real interest rates. But to put so much emphasis on interest rates in investment decisions looks perilously like reasoning from a price change. The central bank has signalled, by cutting its policy interest rate, a more expansive path in monetary policy. But that is, for the economy, a general tendency: entrepreneurs still have to make assessments about particular assets and particular production decisions. As the localised nature of the housing market booms and busts in the US have demonstrated, housing markets experiencing the very same monetary policy can have very different dynamics. More seriously, the claim runs into an information problem--as others have noted, Austrian theory apparently has access to information than none of the market participants do. The central bank knows enough to inflate the economy but none of the market participants have the knowledge to work out what the central bank is doing and the consequences thereof. There is a serious consistent expectations (i.e. rational expectations, but consistent expectations is a more accurate term) problem here. In his (losing) bet with Bryan Caplan, Bob Murphy was being very "Austrian" in assuming his theory gave him information hidden from market participants--Austrian theory really, really believing in markets until it suddenly really, really doesn't. Bryan Caplan was being much more consistent (dare one say rationally consistent) in his expectations by going with the market indicator. What is more plausible--that there is enormously-important-for-future-income information lying around being ignored by everyone except by clever Austrian school folk or that economies are shocked off their growth path: an economic shock being an unanticipated change? These theoretical and empirical problems come together in the record expansion of the Australian economy since 1991. That is, Australia has not had an economic recession (in the sense of two quarters of [negative] economic growth) since 1991. It still has a business cycle, just a very flat one. What is more plausible--that the Reserve Bank of Australia (RBA) got its policy interest rate essentially correct for 23 years straight, so that Australian entrepreneurs got their capital projects (on balance) continually right? Or that the RBA sufficiently anchored inflation and income expectations that the Australian economy has not been shocked enough off its growth path since RBA introduced its policy of aiming for a 2-3%pa inflation rate on average over the business cycle ? Surely, the second option is much more plausible. So, I do not agree with the Austrian School business cycle theory. In particular, I am very unsurprised that an Austrian economist lost by betting against the key market indicator. The Austrian Business Cycle theory presumes special knowledge against market agents and the indicators they generate: a presumption which is not a strength. Still less a reason to accept the theory. "What is more plausible--that the Reserve Bank of Australia (RBA) got its policy interest rate essentially correct for 23 years straight, so that Australian entrepreneurs got their capital projects (on balance) continually right?" 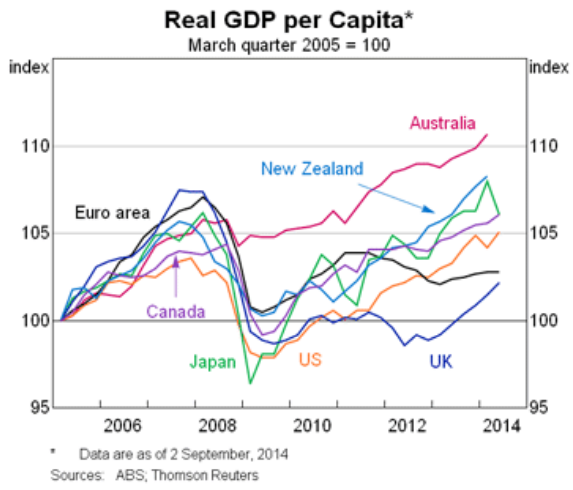 -Or Australia's really closely linked to a major economy growing at 6-12% per year every year since the 1990s. That's the obvious explanation. Lots of countries had inflation targets. Australia is an outlier in several ways. It had the same NGDP shock in 2008 it had in the early 1980s, but had a much smaller RGDP and employment shock in 2008 than in the early 1980s. I attribute this to China's rapid growth in 2008. "So, I do not agree with the Austrian School business cycle theory. In particular, I am very unsurprised that an Austrian economist lost by betting against the key market indicator." -He would have won had he bet against the market on Greek bonds in 2009. And really, Lorenzo, really? That inflation prediction had nothing to do with Austrian Business Cycle Theory. It was just a failure to understand the significance of the Zero Lower Bound. "What is more plausible--that there is enormously-important-for-future-income information lying around being ignored by everyone except by clever Austrian school folk or that economies are shocked off their growth path: an economic shock being an unanticipated change?" Austrian Business Cycle Theory requires one of two things to make it work: imperfect information or rational bubbles. It could work with either alone, or with both. And the boom doesn't have to be one of over-investment; just of mal-investment. Think of the Communist countries. 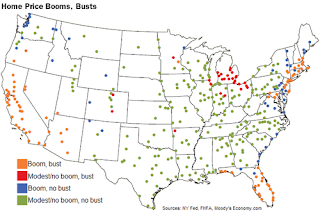 None of them were booming in the 1980s. The U.S. economy wasn't super-strong in 2005. "Again, this conforms far better with the economy being shocked off its growth path before returning to it." -This could work in Austrian theory as well. In the former Communist countries, the capital re-allocation of the 2000s followed the capital disallocation of the 1990s, leading to the fastest growth in their history. Most of them did little more than return to Communist-era trend. "Even when there are supply shocks, (1) monetary policy can counter-balance the effects and (2) such shocks are generally a specific shock to the economy, not rolling capital project failures." -1973-5 was the second-greatest recession in American history since the Great Depression. It also had the most stable NGDP growth. I suspect you saw a lot of rolling capital project failures in that recession, though I haven't studied it much. And 2008 wasn't in C20. "And 2008 wasn't in C20"
That was going to be my question to Lorenzo (when he wrote this: "A business cycle theory that is so dramatically wrong about the two worst economic downturns of the C20th"). Did you really mean two, and if so, what was were they? It is a case of being bad at editing yourself (you know what you mean, without noticing what you actually wrote). I have fixed it. Lorenzo, here's an alternative view on the plucking theory. Basically it's that downturns off trend correspond (with overwhelming probability) to market coordination (group think and panics). Trend growth corresponds to times of essentially random activity (or so complex, it appears random): when information transfer from source (demand) to destination (supply) is ideal. Tom, the link doesn't work. Which is a pity, as whatever you are trying to link to sounds interesting. I think the empirical evidence you offer up against the Austrian theory is stronger than the theoretical evidence. You say: "How can there be a key single, natural or otherwise, rate which can distort the entire structure of investment?" 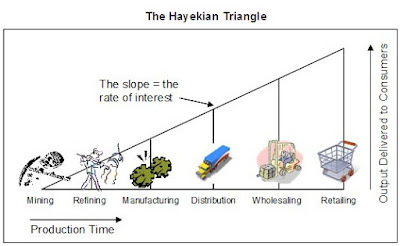 Most Austrians accept the pure time preference theory of interest which holds that there is an underlying rate of interest that equilibrates the demand for present goods over future goods. This rate will be the anchor for all actual market rates on monetary interest, which will vary depending upon risk of any particular loan, price-change expectations, expected productivity growth etc. Austrians believe that an "unhampered" free market would allow these rates to emerge naturally. When the banking system increases the money supply at faster then the expected rate then market interest rates will drop below the equilibrating rates and it will become more attractive to produce goods where interest makes up a a higher than average part of the price. This will be as true for particular as for the general. You say: "What is more plausible--that there is enormously-important-for-future-income information lying around being ignored by everyone except by clever Austrian school folk or that economies are shocked off their growth path"
I do not think that the theory assumes any special knowledge by Austrians on what actual interest rate should be - its a theory about the effects of a particular kind of market distortions that creates a kind of supply shcok that knowck economies off their growth path. You say "What is more plausible--that the Reserve Bank of Australia (RBA) got its policy interest rate essentially correct for 23 years straight, so that Australian entrepreneurs got their capital projects (on balance) continually right? Or that the RBA sufficiently anchored inflation and income expectations that the Australian economy has not been shocked enough off its growth path since RBA introduced its policy of aiming for a 2-3%pa inflation rate on average over the business cycle ?" I think a fuller understanding of the subtleties of ABCT means there is not such a big divergence between these two statements as you think. When a CB targets inflation (or NGDP growth) it is committing itself to a policy that will make it harder to (deliberately or accidentally) instigate a period of lower than natural interest rates and cause an ABCT episode. In theory at least the interest rate that will correspond to successfully hitting the target will also be the (inflation adjusted) natural rate that avoids the ABC.